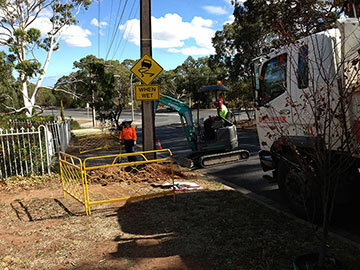 Need underground cable locating completed before your project can begin? What about waste removal or site levelling? Then all you need to do is Dial A Digger! Here at Dial A Digger, we have the talented and skilled operators and quality machinery for hire to complete any project from swimming pool and spa excavation to driveway construction. We have over 30 years of experience behind us, so you can trust that when you hire Dial A Digger, you’re getting decades of experience and knowledge working on your site. We’re ready to take on your project today, so give Dial A Digger a call and we’ll organise your project at competitive prices in Melbourne and Adelaide. The experts here at Dial A Digger have over 30 years of experience providing services from service trenching through to post and stump hole drilling. Throughout our career, we have gained the knowledge and skills to be able to give you the best advice for whatever project you’re completing. We’re the experts in commercial and residential projects and our highly skilled professionals are ready to take on any scale of the project. We supply all our own equipment, so you know you’re getting well-maintained machines at competitive prices. All our operators are fully insured, and background checked to ensure they know how to handle your project and site. Here at Dial A Digger, we believe that we have decades of experience and professional accreditation to be able to provide you with a quick and easy process. We’re passionate about providing you with friendly customer service, so give Dial A Digger a call today and we’ll start planning your next project. Dial A Digger provide a range of construction services from landscape preparation to electrical trench digging and everything in between. We’re ready to take on any project, big or small and our operators are happy to give advice about your excavation or underground cable locating project. So, get in touch with Dial A Digger today to discuss what we can do for your project. Our hire services are available in Melbourne, Adelaide and their surrounding areas including Werribee, Dandenong, Brighton, Seaford, Munno Para, Tea Tree Gully and beyond. Call today on 1300 234 443!